1. 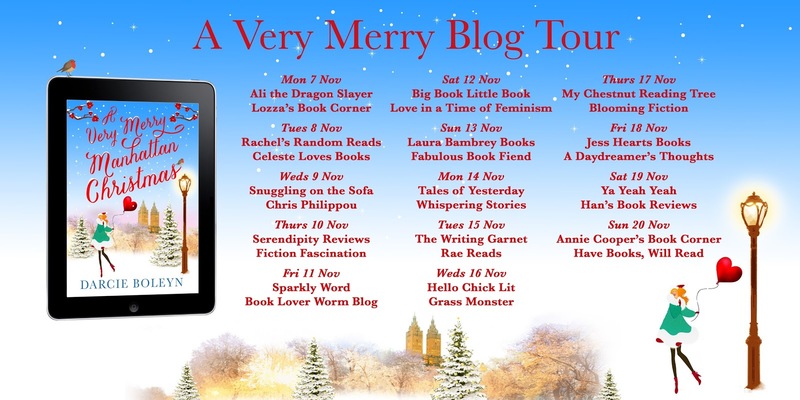 I'll Be Home For Christmas (Various, published by Stripes) - Stunning collection (I'm halfway through, but there's already enough wonderful stories to recommend it strongly) of stories on the theme of home from an amazing line-up of authors - including Non Pratt, Holly Bourne and Juno Dawson! I'm super-excited to have tickets for the YA Salon celebrating this book next week (Wednesday Dec 7th at Waterstones Gower Street if anyone wants to join us!) Also, the book is supporting homelessness charity Crisis so you can feel extra good about yourself when asking for it. 2. Winter Magic (Various, curated by Abi Elphinstone and published by Simon & Schuster) - Another brilliant collection - again I've only read some stories as I'm savouring it, but the combination of great ones I've read (Amy Alward's Potion Diaries spin-off rocks!) and awesome authors to look forward to (including Abi and Katherine Woodfine!) make me really happy to recommend it. 3. The Good Immigrant (Various, edited by Nikesh Shukla, published by Unbound) - Yet another that I'm midway through, but I adore what I've read - especially my friend Wei Ming Kam's piece - and it's being celebrated by EVERYONE I know who's read it as a stunning collection of essays from BAME writers. Plus, if you somehow missed it, it won the Reader's Choice award at last week's Books Are My Bag Awards - a huge sign of quality! 4. The Snow Spider (Jenny Nimmo, published by Egmont) - I love Egmont's gorgeous new edition of one of my favourite childhood reads. This winter story works beautifully as an adventure, but also (I have to admit I didn't pick up on this as a child) as an incredible study of a family's grief after their daughter's disappearance. 6. The Last Of The Spirits (Chris Priestley, published by Bloomsbury) - I think nearly everyone is familiar with A Christmas Carol, by Charles Dickens, but this outstanding twist on the story - showing the trials of two homeless children who beg Scrooge for charity and are turned down - is a brilliantly layered companion read. 7. The Lie Tree (Frances Hardinge, illustrated by Chris Riddell, published by Macmillan) - Like The Good Immigrant, not Christmas themed but still a perfect gift. The Costa-winning The Lie Tree was already one of my favourite books of the last few years - a feminist classic of historical fantasy, showing an outstanding heroine as she tries to solve the mystery of her father's death. Adding illustrations from the phenomenal Chris Riddell makes it even more of a must-buy. 8. Mistletoe and Murder (Robin Stevens, published by Puffin) - As with The Dark Is Rising, this is a must-read series - the Detective Society of Daisy Wells and narrator Hazel Wong are one of my favourite crime-solving teams! I actually wouldn't recommend reading out of order because seeing the two girls' friendship develop is a big part of what makes the series so special, but they are the type of cozy mysteries that would be perfect for binge-reading, so why not just ask for all 5 and devour them as quickly as possible? 10. Unboxed (Non Pratt, published by Barrington Stoke) - My third non-holiday related pick, but again there's a good reason. For me Christmas is about family, friends, and remembering people you miss. After initially expecting to have to wait until 2017 for a new Non Pratt book, I was exceptionally excited to hear we were getting her first Barrington Stoke book this year and it surpassed my high expectations. The story of four former friends meeting together to open up a memory box they'd hidden five years ago - along with a fifth friend who has recently passed away - brought me to tears; Non can pack more emotion and character development into a relatively short book than many authors can into a much longer novel. Read it, call someone you miss, and tell them how you feel. 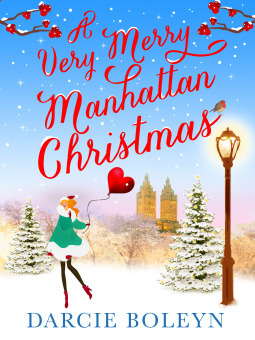 I'm a big fan of Christmas books, with the holiday fast approaching, so I'm thrilled to be hosting a spot on the tour for Darcie Boleyn's A Very Merry Manhattan Christmas and spotlighting the book today. The Good Immigrant (edited by Nikesh Shukla) – I was thrilled to support this on Unbound and even more delighted to get my hands on it. It’s a stunning collection of essays by BAME authors on race and immigration. I’ve read my friend Wei Ming Kam’s piece, which is superb, already, and am looking forward to reading the rest. Winter Magic (curated by Abi Elphinstone) – There’ve been some great MG short story collections recently – including Egmont’s Mystery and Mayhem – but this one from Simon & Schuster looks especially fabulous. It’s a gorgeous hardback and contains lots of fabulous authors, including Abi herself, Lauren St John and Katherine Woodfine. I’ve dipped into a few stories and really loved Amy Alward’s – perfect whether or not you’ve read the rest of her Potion Diaries series. I’ll Be Home For Christmas – The other big anthology at the moment, Stripes are donating some of the proceeds from this one to homelessness charity Crisis, so it’s a way to check out lots of fantastic authors AND do some good. I’ve read a few more from this and Non Pratt’s and Cat Clarke’s, especially, stand out as amazing. Uprooted by Naomi Novak – My timeline recently has been FULL of people loving this fantasy novel! Intrigued to see what all the hype is about. Ink by Alice Broadway – One of the most stunning proofs I’ve ever been sent, I don’t actually know much about this one but it looks breathtaking. The Goldfish Boy by Lisa Thompson – Debut mystery about a boy with OCD trying to solve the disappearance of a toddler staying next door sounds completely intriguing. One Man Guy by Michael Barakiva – Recommended by both Peter Bunzl and my friend Debbie – who kindly lent it to me – this sounds like a super-cute m/m romance. Chasing Danger by Sara Grant – Fab to go to the launch of Mystery at the Ice Hotel last week, at London’s Ice Bar, but I feel really guilty that I’ve not quite got around to reading the first book in the series yet. I’ll definitely change that soon as it sounds like a fun adventure. Optimists Die First by Susin Nielsen – I’ve seen lots of people talking about how great this one is already, and as a big fan of Susin’s – I especially love We Are All Made Of Molecules – I’m excited to read it! I Kill The Mockingbird by Paul Acompora – An impulse buy at Queen’s Park Books a few weeks ago, this book about children launching a reverse psychology campaign to ‘ban’ To Kill A Mockingbird so that their class gets more excited to read it for school sounds really wonderful! Why So Many Profile Pics? I spent so many years of my life being camera-shy that author Allan Boroughs' memorable description of my profile pic as "the hottest real estate on Twitter" (which I think was maybe 200 profile pics ago) still seems like one of the strangest things I've ever had said about me. However, while Allan is clearly an expert at flattery, it IS nice that people seem to enjoy being in it - and even nicer that I like updating it with new pictures in which I think I look ok. So, after 31 years or so in which I instinctively tried to avoid having ANY pictures of myself on the internet (Okay, admittedly, for over half those years no-one I knew had even USED the internet, which made that part easier), how did I end up posting quite so many pictures of myself? When I moved down here originally, I'd been teaching in a secondary school for 7 of the 8 years prior to getting this job. I'd seen bad things happen to teachers on Facebook - fake profiles set up, groups started solely to talk about how much people hated them - and coupled with my long-held dislike of the way I looked, that was enough for me to be very keen to keep any photos of me far away from public viewing. 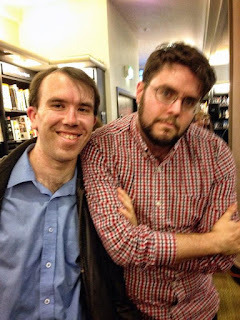 Of course, David knew none of this when, at an event, he grabbed my phone, got Daphne to take a photo of us together, and said "Go on, put that as your new profile pic." (At least he ASKED then; now he just uploads them himself on the rare occasions I see him!) I did, fully intending to take it off moments later. And then I think I forgot until the next morning - as David was there, I'm assuming I drank large amounts of Prosecco. And then when I woke up the next morning, I went to take it off, and decided not to. Partly because I really liked the way I looked in it. (I HATE photos of me without glasses normally so this was a BIG DEAL.) I still don't consider myself to be good-looking in it (or in any picture to be honest!) but I'm smiling (it may be the first picture taken of me this decade where I was! ), I'm standing next to someone I really like, and my hair could be worse - and often is. (Also it's kinda blurry, which helped!) Partly because I was trying to figure out the probability of anyone from the college I teach at seeing it and expending the effort to do anything bad with it, and I decided that our students are a) too nice to do that and b) have better things to do with their lives, to be honest. So I left it up. And then people started commenting on it. (PATRICK NESS commented on it!) 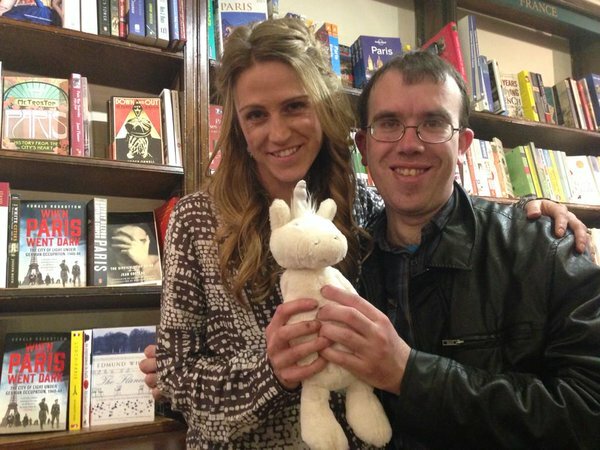 And at some point down the road, superstar author Abi Elphinstone decided she wanted to be in it, so we took one together. And then a couple of other people joined in, there was friendly rivalry between David and Abi culminating in one of the three of us together, and people seemed to enjoy them. And then somewhere down the line - I'm not sure where exactly (so many book events, so much Prosecco!) it became something of a thing. It went from me tentatively asking people if they wanted to be in one, and crossing my fingers they didn't laugh at me (somehow, this rarely happens! ), to a few people asking me if they could be in it. (Yes, I know most people are just humouring me, but it's nice that they do that!) It's featured dozens of bloggers, a huge amount of UK authors, and even some who've come over from the US for events and I've been lucky enough to meet - as well as two dogs (Buffy and Pluto) and one baby - my friend Daphne's lovely daughter Theia. And somehow, every time I put another photo up, I get a little bit more confident about showing my face. Yes, I still need to take 7 or 8 attempts at it sometimes (or, more realistically, get someone else to take 7 or 8 attempts!) in order to get an angle when I'm even vaguely happy with my chin. But I like the way that I smile when I'm with people I'm a friend of/fan of (in a few cases, both!) I feel my happiness at having a fun time shines through. And, as my friend Debbie said at Sara Grant's wonderful Ice Bar launch, they've started to form a really nice record of great days/evenings. From Katie Webber's first event as a chair, interviewing Leigh Bardugo, to Lauren James and Alice Oseman in Birmingham, via the brilliant launch for the Mystery and Mayhem short story collection, and from numerous #DrinkYA events to lots of cinema and theatre trips, and other days out with fabulous friends, looking back through them reminds me of lots of amazing times. 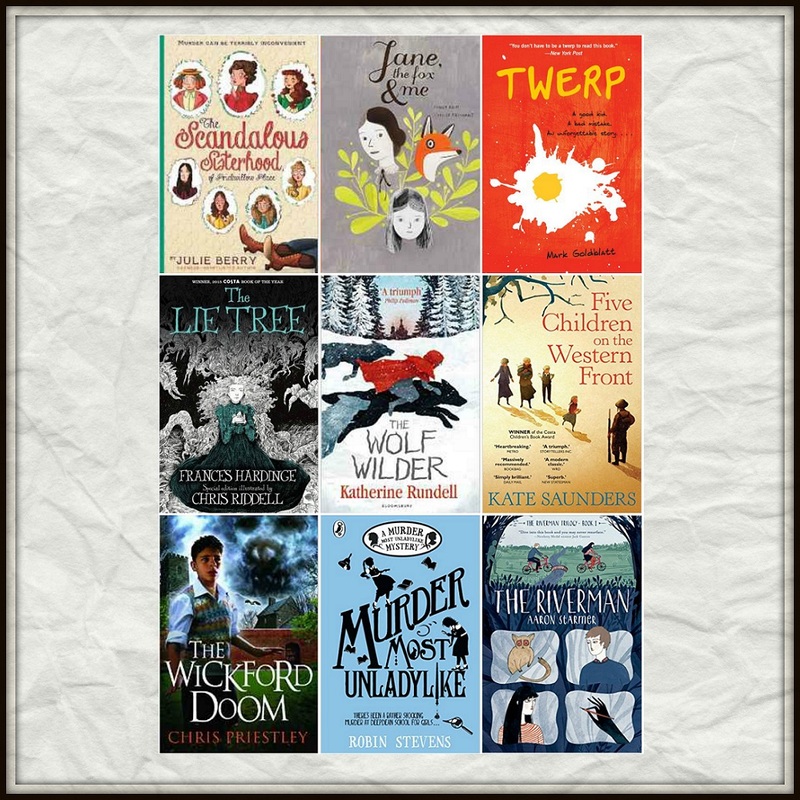 I thought I'd recommend some middle grade books/series that I think would be particularly interesting reads for book clubs. Murder Most Unladylike series by Robin Stevens (Puffin) - Fabulous historical detective novels which have clever plots and wonderful characters. In addition, it's a stunning look at the racism narrator Hazel Wong faces, and the way that her friendship with Detective Society leader Daisy Wells changes as the series progresses. The Wolf Wilder by Katherine Rundell, illustrated by Gelrev Ongbico (Blloomsbury Children's) - Wonderfully lyrical historical adventure story with gorgeous illustrations. Rundell's prose is near-peerless amongst current writers and lead character Feo - a 'dark and stormy girl' - is one of my favourites for years. Her quest to rescue her mother - aided by other children and the three wolves that she and her mother have been trying to re-introduce to the wild - is a magnificent story. The Riverman by Aaron Starmer (Square Fish - US import) - 12-year-old Alistair Cleary is deputised by mysterious neighbour Fiona Loomis to write her biography, telling the story of the gateway in her basement to a magical world. But in this world, the mysterious Riverman steals the souls of children. Should Alistair believe her tale? Or is something even worse happening to her? This is confusing at times but breathtaking often, an amazing one to discuss. The Lie Tree by Frances Hardinge, new version illustrated by Chris Riddell (Macmillan) - MG/YA crossover maybe, but I wanted to include this (especially since there's a new edition out with illustrations from the wonderful Chris Riddell!) The story of Faith's search for the truth behind her father's death, and the strange tree that bears fruit related to lies you spread, is a strange but gripping historical fantasy. It's also brilliantly feminist, with so many wonderful female characters. The Wickford Doom by Chris Priestley, illustrated by Vladimir Stankovic (Barrington Stoke) - This novella shows Priestley's skill in building up an incredibly creepy atmosphere in a short book, as Harry and his mother, after the war, seemingly fall prey to a cruel prank only to realise there could be something far more evil than a nasty joke to worry about. A perfect post-Halloween read. 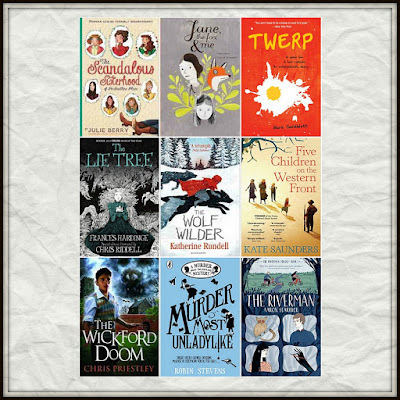 The Summer of Telling Tales by Laura Summers (Piccadilly Press) - Ignore the cover that makes it look like it's for very young readers (I've left it out of the collage to make it easier to ignore!) this is a stunning read - switching between fun, scary, and life-affirming as it tells the tale of two girls and their mum who are on the run from their domineering and abusive father. The two girls blossom in new surroundings - but can they ever be free from their dad's shadow? Twerp by Mark Goldblatt (Random House - US import) - This is a fascinating read, where Julian Twerski writes a journal about something which got him suspended from school. The narrator skirts around the issue for as long as possible - leading it to initially feel more like an interconnected set of short stories than a novel - but things eventually get tied together superbly. Great characters and an awesome New York 1960s setting add to reasons to recommend it, while Julian's voice is fabulous. 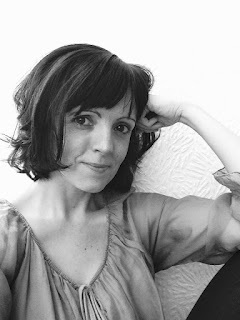 Five Children on the Western Front by Kate Saunders (Faber Children's) - A well deserved winner of the 2014 Costa Children's Book Award, Kate Saunders' sequel to E Nesbit's books is an outstanding read which shows just how well a talented author can do in breathing new life into familiar characters. The Psammead and the children here are portrayed brilliantly and it's an incredibly moving read. The Scandalous Sisterhood of Prickwillow Place by Julie Berry (Piccadilly Press) - Reading like an MG version of an Alan Ayckbourn farce, this Victorian murder mystery - which shows the seven schoolgirls at St Etherelda's School For Young Ladies try to cover up the sad news of the deaths of the headmistress and her brother - is a hilarious read. It's really interesting to look at the way Julie Berry plays with expectations even in her characters names, with Smooth Kitty, Disgraceful Mary-Jane, and so on, being revealed to have more layers than these adjectives may lead us to believe. Jane, The Fox and Me by Fanny Britt and Isabelle Arsenault (Walker Books) - Beautiful graphic novel which shows the story of a girl who thinks of herself as fat and plain and buries herself in Jane Eyre to avoid bullies. The combination of a muted palette for much of the book, and flashes of colour as Helene reads about Jane Eyre, stands out as being gorgeous, while Britt captures the poignancy of the lead's despair in her sparse, well-chosen words.